Fran McIntyre at the renovated Learning Lab playground. When children in the Cal Poly Preschool Learning Lab climb to the top of their new playground equipment, they can see all the way across the campus. Through the eyes of a 4-year-old, it’s a little bit like climbing a mountain. That’s exactly the idea, explained Learning Lab Director Patty Clarkson. Preschoolers need to be able to take risks within safe limits. “It builds self-confidence and resilience, and they become spatially aware of their bodies,” she said. Such an interactive space also allows for creative, dramatic play, such as when the children recently divided the playground tower’s platform into a living space and pretended they were a family of dogs. The children at the Learning Lab have someone to thank for their new state-of-the-art outdoor learning space. The recently completed tower structure is the capstone of a nine-year project led by Cal Poly human development alumna Fran McIntyre. 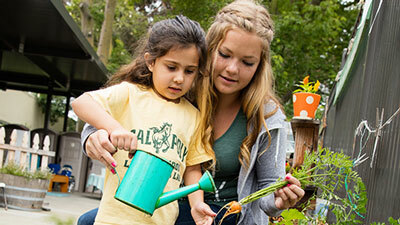 new garden with Cal Poly students. 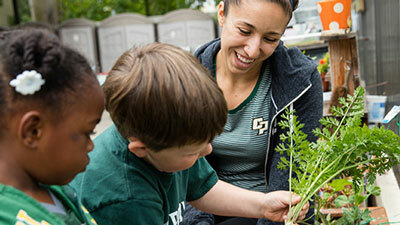 In addition to providing a high-quality preschool environment, the Learning Lab serves as a site for Cal Poly students to research child development and gain hands-on experience working with children. McIntyre knew the outdoor space did not give children many opportunities to engage in constructive play, which limited Cal Poly students’ ability to innovate in their work with the preschoolers. “We decided that we needed to find a way to redesign the playground so we could bring the curriculum of the Learning Lab outdoors,” she said.